This page written and copyright 2008 by Will Johnson, Professional Genealogist. This page is locked, if you have any comments you can email me at wjhonson@aol.com. William Bradley "Brad" Pitt was born 18 Dec 1963 in Shawnee, Pottawatomie County, Oklahoma, the eldest of three children born to William Alvin Pitt, who worked in management at a truck company and his wife Jane Etta Hillhouse, a high school counselor. Along with his brother Doug (b. 1966) and sister Julie Neal (b. 1969), he grew up in Springfield, Greene County, Missouri, where the family moved soon after his birth. Pitt was raised a Baptist. He attended Kickapoo High School, where he was involved in sports, debating, student government, and acting. He attended the Missouri School of Journalism at the University of Missouri–Columbia, but dropped out before getting his degree. He is a member of the Sigma Chi Fraternity. His first speaking role was in 1988 in The Dark Side of the Sun, however his first widely known role was as the cowboy drifter "J.D." in Thelma and Louise (1991), which showed him without his shirt. Brad Pitt married on 29 Jul 2000 at Malibu Beach, Los Angeles County, California to Jennifer Joanne Aniston who had been born 11 Feb 1969 in Sherman Oaks, Los Angeles County the daughter of John Aniston and his wife Nancy Dow. They separated on 7 Jan 2005, Jennifer filed for a divorce 25 Mar 2005, but the divorce was not finalized until 2 Oct 2005. Since 2005 he has been in a relationship with Angelina Jolie (b. 1975), they have one biological child together, and they have three other children, two which Brad adopted after the relationship started, and one other they adopted while together. Angelina is daughter actor Jon Voight and actress Marcheline Bertrand. 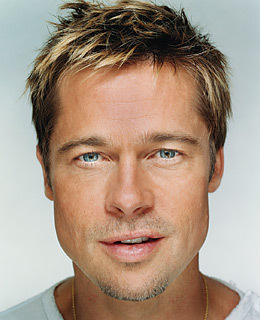 Brad Pitt starred in the 2004 Movie Troy. Watch it on YouTube at this link. William Alvin Pitt was born 24 Mar 1941 "presumably in Cleveland County, Oklahoma", the son of Alvin Monroe Pitt and his wife Elizabeth Jean Brown. According to his father, Alvin Monroe Pitt's funeral notice in Mar 1959, "Billy" was then living in Shawnee, Oklahoma. On 11 Aug 1962 while a resident of Shawnee, Pottawatomie County, Oklahoma he married, in Joplin, Jasper County, Missouri to Jane Etta Hillhouse, a resident of that town. The family were living in 1963 in Shawnee, Pottawatomie County, Oklahoma when their son William Bradley "Brad" Pitt was born there that year, but shortly thereafter moved to Springfield, Greene County, Missouri where their three children grew up. William Alvin Pitt has been called both "the owner of a trucking company" and "working in management for a trucking company." Missouri Marriage Records, 1805-2002 : "License: William A Pitt of Shawnee, Pottawatomie County, Oklahoma, age 21; Jane E Hillhouse of Joplin, Jasper County, Missouri, age 21, dated 8 Aug 1962; Certificate: Thurman D Kelley, Minister, did at Joplin, Jasper County on 11 Aug 1962 did unite the above named persons." Jane Etta Hillhouse was born in Missouri in 1940/1, the daughter of Hal Knox Hillhouse and his wife Clara Maurine Bell. On 11 Aug 1962, in Joplin, Jasper County, Missouri as a resident of that town, she married William Alvin Pitt, a resident of Shawnee, Pottawatomie County, Oklahoma. The family was living in 1963 in Shawnee, Pottawatomie County, Oklahoma when their son William Bradley "Brad" Pitt was born there that year, but shortly thereafter moved to Springfield, Greene County, Missouri where their three children grew up. Alvin Monroe Pitt was born on 7 Mar 1913 in Haworth, McCurtain County, Oklahoma, the son of Oliver Brown Pitt and Rosa Lee Dorris. Robert Yerton reports that "the funeral notice for Alvin in The Mobile Register, states that Alvin was a native of Hayworth, Oklahoma." Alvin's parents must have just recently married as Oliver is yet single in the 1910 census living with his parents. Alvin's parents divorced between 1912 and 1920, with his father marrying secondly Ellen Unknown with whom he appears as his wife in the 1920 census. I haven't yet found Alvin nor his mother Rosa "Rosie" in the 1920 census but she married secondly to Henry Wheatley and thirdly in Dec 1924 in Union County to William "Bill" Spooner. Alvin is living with his mother and step-father in 1930 in Smackover Township, Ouachita County, Arkansas. Alvin must have moved back to Oklahoma, and married Elizabeth Jean "Betty" by 1941 as his son William Alvin Pitt is said-to-have been born in or near Cleveland County, Oklahoma that year. Alvin and Betty must have divorced and Alvin then moved back to Mobile County, Alabama. Alvin Monroe Pitt, died on 4 Mar 1959 in Mobile County, Alabama and is buried there in Mobile Memorial Gardens Cemetery, the same cemetery his mother would be buried in fourteen years later. His funeral notice appeared in the Mobile Register. His mother was the informant on his death certificate as "Mrs Rosa Spooner". 1930 Census of Smackover Township, Ouachita County, Arkansas : "Bill Spooner, Head, owns home, worth $2000, Male, White, 33, married first at age 28, born AL/AL/GA, pumper, Creek Oil Prod. ; Rosie, wife, female, white, age 30, married first at age 25 [sic], born AR/AL/AR, saleslady, dry goods store; Alvin Pitt, step-son, male, white, 17, single, born OK/MO/MO; Lewis Dorris, nephew, male, white, 17, single, born AR/AR/AR"
Alabama Deaths, 1908-59 : "Alvin M Pitt, died 4 Mar 1959, Mobile County, Alabama"
"Reader seeks information on Pitt family", 30 Jan 2008 "My great-great grandfather was William H. Pitt, who was born in North Carolina in 1818. He married Cynthia Parker in Marshall County, Ala., on May 30, 1841. My great-grandfather Thomas M. Pitt was born in 1848 in Alabama. Thomas married my great-grandmother, Margaret Mahan, in Monroe County, Miss., in 1868. Margaret died sometime after 1880 and Thomas later married a woman named Belle Armer (could have been Belle Armon or Belle Ray). It is believed that Thomas and Belle had one son named Oliver Pitt. My great-uncle Oliver moved from Hayworth, Okla., to Louisiana. He and his wife, Rosa Lee Dorriss, had a son, Alvin Monroe Pitt, my father's first cousin, who lived in Mobile and died there March 4, 1959. I have been told that Alvin was the grandfather of Brad Pitt, the actor. I've also been told that Alvin M. Pitt's obituary in the Mobile Register stated that his son "Billy" was living in Shawnee, Okla. at that time. William (Billy) Alvin Pitt was the father of Brad Pitt, who was born in Shawnee in Pottawatomi County, Okla. in 1963. I understand also that the Isbells are cousins of Brad Pitt. Would anyone in the Mobile area help me locate Alvin M. Pitt's obituary to verify this information? This would be very much appreciated. Karen Pitt Blaylock 508 Eduardo St. Anthony, TX 79821 E-mail: Swennie2@yahoo.com"
Elizabeth Jean "Betty" Brown was born in 1922 in Oklahoma, the daughter of Lester B Brown and his wife Una Valerie Coker. In 1930 the family is living in Bethany, Oklahoma County, Oklahoma. Betty married firstly, probably in Oklahoma to Alvin Monroe Pitt. They evidently lived in or near Cleveland County, Oklahoma in 1941 where their son William was supposed to have been born that year. Betty and Alvin must have divorced prior to 1959 when he died in Mobile, Alabama as the informant on his death certificate was his mother "Mrs Rosa Spooner." Betty lastly married a Mr Russell. She currently lives in Shawnee, Pottawatomie County, Oklahoma as "Betty J Russell". David Crawford and his wife Jane of New Kent County, Virginia, but ignoring the flaw that Jane's maiden name is not known, and that David's grandfather as the Malcolm Crawford who d 1592 has been disproved. Hal Knox Hillhouse was born 13 Mar 1911 and died 15 Nov 1976. Via the Dobbin family, then via the Boyd family, then via the Craig family to here, then up to here. "James V Stewart" there is King James V of Scotland. Alternatively by the same route, up to here. Robert Stewart, the husband of Elizabeth Mure there, is King Robert II of Scotland. The Bethune/Beaton line looks bizarre to me, I can't yet comment on it, it seems completely mixed up. Via the Gibson family to the Gaston family yields a surprise here. Probably not true, but worth checking out. Oliver Brown Pitt was born 24 Aug 1891 in Honey Grove, Fannin County, Texas, the son of Thomas Monroe Pitt and his wife Mrs. Mary Isabella ( ) "Belle" Armor. In 1910, he is single and living with his parents in Webster County, Louisiana. However sometime before early 1913 he must have either married or had a relationship with Rosa Lee Dorris and by this they had their son Alvin Monroe Pitt, born 7 Mar 1913 in Haworth, McCurtain County, Oklahoma. Oliver appears in a World War I Draft Registation Card living in 1917 in Haworth, McCurtain County, Oklahoma where he states that he is then married and working in a saw mill. It's not yet clear if he was still married to Rosa (if they ever married at all), or if he here is married already to his second wife Ellen Unknown. He and Ellen appear in the 1920 census, married, no children, living in McCurtain County, Oklahoma. In 1922/3, Oliver married thirdly to Hazel Unknown, and by 1930 they had moved back to Webster County, Louisiana where he is living with his wife, 6-year-old son Stanton Pitt and widowed mother Belle. 1910 Census of Police Jury Ward 2, Webster County, Louisiana : "Thomas M Pitt, Head, white, male, 61, married second time, 20 years ago, AL/TN/GA, Farmer, General Farm, rents home; Belle, wife, female, white, 56, married second time, 20 years ago, mother of 4, 3 living, TN/TN/TN, no occupation; Oliver, son, male, white, 18, single, TX/AL/TN, farm labor, home farm; (also living with them is the William Alford family)"
World War I Draft Registration Cards : "Oliver Brown Pitt of Haworth, Okla., born 24 Aug 1891 in Honey Grove, Texas; Saw Mill Labor for Anne Shoveltowl Co near Harris Okla; married; primary support of mother and father; medium build, medium height, light blue eyes, brown hair, no disabilities; 5 Jun 1917"
1920 Census of Frisco, McCurtain County, Oklahoma : "Oliver Pitt, boarder, male, white, 28, married, TX/AL/TN, Carpenter, house; Ellen, boarder, female, white, 25, married, MO/TN/MO, no occupation"
1930 Census of Police Jury Ward 2, Webster County, Louisiana : "Oliver B Pitt, Head, rents home, 38, married, first at 31, TX/AL/TN, Farmer, General farm; Hazel, wife, 23, married first at 15, SC/NC/SC, no occupation; Stanton C, son, 6, LA/TX/SC; Bell Pitt, mother, 76, widow, TN/TN/TN, helper"
Rosa Lee Dorris was born 6 Jun 1893 in Camden, Ouachita County, Arkansas, the daughter of George Washington Dorris and his wife Nancy Rosaleen Smith. She married first to Oliver Brown Pitt between 1910 and 1912 and they had a son Alvin Monroe Pitt born 7 Mar 1913 in Haworth, McCurtain County, Oklahoma. She and Oliver divorced before 1920, she remarried to Henry Wheatley. On 8 Dec 1924 in Union County, Arkansas she married thirdly to William Monroe "Bill" Spooner, and they moved back to Ouachita County, where they appear in the 1930 census. When her son Alvin died in Mobile, Alabama in 1959, Rosa was the informant on his death certificate and she was then described as living in "Spring Hill, Alabama". Rosa Lee Dorris died 5 Oct 1973 in Spring Hill or possibly in Mobile, Mobile County, Alabama, and is buried there in Mobile Memorial Gardens Cemetery. 1930 Census of Smackover Township, Ouachita County, Arkansas : "Bill Spooner, Head, owns home, worth $2000, Male, White, 33, married first at age 28, born AL/AL/GA, premper ?, Creek Oil Prod. ; Rosie, wife, female, white, age 30, married first at age 25 [sic], born AR/AL/AR, saleslady, dry goods store; Alvin Pitt, step-son, male, white, 17, single, born OK/MO/MO; Lewis Dorris, nephew, male, white, 17, single, born AR/AR/AR"
Lester B Brown was born 1902/3 in Oklahoma. Some trees in the Ancestry World Tree project claim that he was born on Sep 1902 and was the son of George Washington Brown and his wife Cynthia Martin. I'm not happy so far with those sources that do not cite any underlying source. The main thing that bugs me is that in the 1930 census Lester B Brown's birthstates are given as "OK/MN/NE". This is a very odd response as you can see. The parents ascribed to him however were both born AR which is a rather normal response for an Okie. I would really like to see some better sources on his purported parents. He married Una Valerie Coker about 1921/2, probably in Oklahoma. Their eldest child Elizabeth Jean "Bettie" Brown was born about 1922/3. In 1930 the family was living in Bethany, Oklahoma County, Oklahoma where he was a freight agent for the railroad. Lester Brown and Una Coker divorced, probably in Oklahoma. 1930 Census of Bethany, Oklahoma County, Oklahoma : "Lester B Brown, 27, OK/MN/NE, Freight Agt, R.R. ; Euna V, 27, TN/TN/TN; Bettie Juan Brown 7; Benny June Brown 4 9/12; Amaryllis Larue Brown 2 8/12; Catherine ROBERTS 23"
Social Security Death Index, "Lester Brown, born 20 Aug 1902, died 7 Nov 1987, SSN issued by Arkansas, last residence Arlington, Tarrant County, Texas"
Una Valerie Coker was born in Tennessee, probably in Sevier County, in 1903/4, the daughter of Richard Ogle Coker and his wife Laura Trotter. Other than her first husband Lester Brown, Una was also married to Charles Cerba (1896-1978), a native of Cleveland, Ohio who died in Shawnee, Pottawatomie County, Oklahoma. 1920 Census of Cleveland County, Oklahoma showing: "Richard Coker 47; Laura Coker 36; Zola Coker 21; Ruddy Coker 20; Una Coker 16; Glen Coker 14; Lucy Coker 12; Milburn Coker 10; Charla Coker 3"
Texas Death Index, "Una Cerba died 12 Nov 1997 Tarrant County"
"Una Valerie Coker", The Robert Yerton Family Homepage by Robert Roland Yerton, Jr. of Tulsa, Oklahoma robertyerton@cox.net, citing "Shawnee News-Star Obituaries (Archives)", Shawnee, Oklahoma: Shawnee News-Star, 12 Nov 1997"
Thomas Monroe Pitt was born 1848/9 in Alabama. Thomas was married twice. By his first wife Margaret he had a number of children. After her death, he married secondly in 1888 in Hempstead County, Arkansas to Mary Isabella "Bell" Armor and they had one surviving child Oliver Brown Pitt, born 1891 in Honey Grove, Fannin County, Texas. Thomas Monroe Pitt died sometime between 1910 and 1930, probably in Webster County, Louisiana. In 1930 his widow "Bell" is living, as "mother" and a widow, with her son Oliver in Webster County, Louisiana. 1880 Census of Precinct 3, Lamar County, Texas : "Thomas M Pitt, 32, Farmer AL/TN/AL; Margaret, 32, Keeping House AL/SC/SC; William M 10 TX/AL/AL; Charles T 5 TX/AL/AL; George A 4 TX/AL/AL; John R Apr 1880 TX/AL/AL"
Armor was not her maiden name. When she married in 1888 she was already Mrs Bell Armer. This page was last modified on 29 October 2012, at 18:56. This page has been accessed 530,813 times.